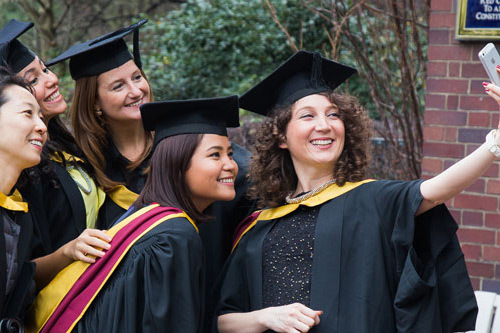 Over 2,200 students graduated and six individuals were recognised by means of honorary degrees at City, University of London’s January graduation ceremonies. The three days of ceremonies, which were held at the Barbican Centre in the heart of the City of London, celebrated the achievements of students graduating from City’s five Schools. During the week, City awarded honorary degrees to six esteemed individuals: Lord Anthony William Hall of Birkenhead CBE, The RT Hon The Lord Mayor of London Alderman Charles Bowman, Mr Thomas Ilube, Captain Panagiotis Tsakos, Mrs Tessa Green CBE and Professor Anthony Finkelstein CBE. The Rt Hon The Lord Mayor Alderman Charles Bowman was installed as the University’s Rector and awarded the honorary degree of Doctor of Science in recognition of his outstanding contribution to the City of London. On Monday, Lord Hall of Birkenhead, the Director-General of the BBC, was awarded the honorary degree of Doctor of Arts in recognition of his outstanding contribution to the profession of journalism. On Tuesday, Thomas Ilube, the founder and CEO Crossword Cybersecurity plc, was awarded the honorary degree of Doctor of Science. Captain Panagiotis Tsakos, who established Tsakos Shipping and Trading SA, the flagship company of what is now known as the Tsakos Group, was awarded the honorary degree of Doctor of Science. On Wednesday, Tessa Green, Chair of Moorfields Eye Hospital NHS Foundation Trust, was awarded the honorary degree of Doctor of Laws for her commitment to excellence in healthcare. Professor Finkelstein, the Government’s Chief Scientific Adviser for National Security based at the Alan Turing Institute, joined his brother and late father in becoming an honorary graduate at City, when he was made a Doctor of Science. Six students were chosen to speak during the graduation ceremonies, where they reflected on their time at City and the support they have received. “We as health professionals, in a year or two will be mentors ourselves, answering the ‘why’ questions, which we were asking not long ago. This graduation is just the first step of a long journey in an amazing career – even though we may work at Christmas or New Year! You can catch up with the action on City’s official social media channels, including Facebook, Twitter and Instagram. The hashtag is #CityGrad and you can still share your pictures and memories of graduation on social media.